The Strike King Pure Poison has a unique head design, blade and harness that produce incredible action and vibration. 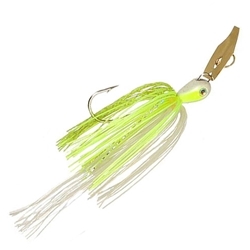 The Pure Poison extreme action swim'n jig are terrific just about anywhere you would fish a spinnerbait or swim a jig. It features the Perfect Skirt with Magic Tails which gives it an enhanced action compared to regualr skirts and the colors match the head. The Strike King Pure Poison also comes equipped with a long shank premium hook ensures great hook ups, 3D eyes to give a realistic appeal, and the special split ring line tie is strong and secure.